Just translate your Game or App into a NEW language! 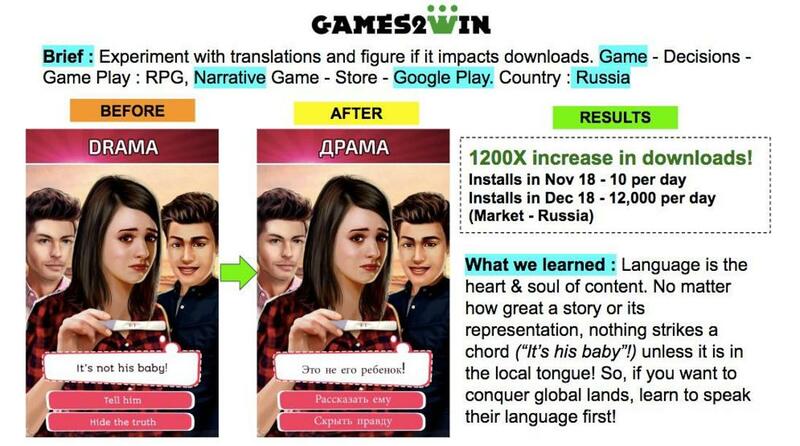 Nothing can describe the success better of this concept than the experience we had with our Game “Decisions” and the new translations we did for our stories for the Russian Market. Internally, we had a disagreement internally. Each story in our Decisions game has 30-40k words. The game has 7 stories, and we add 2 new stories a month. Given that we have mandatory translations for FIGS (French, Italian, German, Spanish), the costs add up substantially. (several ‘000’s of $). In this case, the PM of the game refused to accept the pitch to translate the game to Russian & spend an additional US$ 6k (for 3 stories). “Who will guarantee me my ROI?”, she asked. We went ahead with it and what an amazing outcome was achieved! Check out the case study in the pic. We hit #2 in Russia and recovered all the investments in 1-month itself. 1) “Be calculatingly bold”. In this case, it was a no-brainer given the need-gap-product-fit we figured in the Russian Market. 2) Study markets & their app populations all the time.